We do not exaggerate by affirming that the guacamole is without a doubt the most popular dip of the World. And for this reason there are countless variations of the recipe. In this occasion we are going to prepare an exquisite guacamole with banana pepper, that will result just as good as the traditional but with the aromatic, fine and tasty touch of this chili . Besides using banana peppers also parsley is used to enhance the fresh and different flavor that this guacamole provides – it also gives an intense and persistent aroma. The banana pepper guacamole is a perfect snack for any reunion, accompanied of some tortilla chips or simply to enrich some quesadillas. The preparation of this guacamole is very simple. It is very important to use the juice of the lime in the guacamole so the avocado doesn’t oxidize. The parsley sprig that is used in the recipe has to be fresh so the guacamole has more flavor, freshness and aroma. 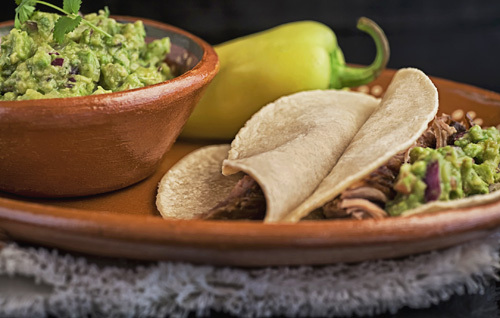 This guacamole can also be prepared in a molcajete and you will feel the true Mexican tradition. Only 10 minutes will be needed for this preparation. Separate from 1 parsley sprig the leaves from the stalks and discard the stalks. Finely chop the parsley leaves that were separated, then reserve. Remove the seeds and the veins of 2 banana peppers. Dice the 2 banana peppers with the ones you worked, 1/4 of an onion and 1 tomato; then set aside. The dices of the Banana Peppers that were cut. The avocado pit serves to preserve the banana pepper guacamole for a longer time. Tip: Preferably serve immediately the guacamole so it will be fresh and full of flavor. Variation: The guacamole can also be prepared with corn , which turns it sweet and crunchy. Did you like the Guacamole with Chilies? Have the experience of preparing the guacamole in a molcajete. Serve the guacamole in this bowl with ice so it preserves fresh for a longer time. You can also serve the guacamole in a molcajete for salsa and it will look very Mexican.